Hey guys! Hope you are having a wonderful Sunday! So, my brother is in town for a good month on his rotations for pharmacy school, which is awesome because I’ve been missing my family since I moved away. His co workers at the pharmacy requested these cookies and I thought heck, why not share it with all of you! I don’t know if you guys know this but coffee and chocolate are two peas in a pod! The flavor profiles work amazingly together. 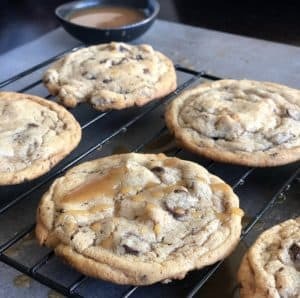 If you love coffee and chocolate then this is the cookie for you without a doubt. 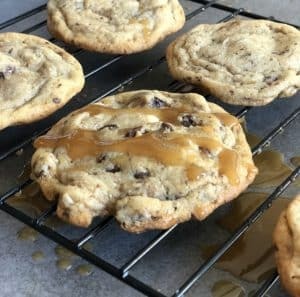 It’s gooey and chewy; the perfect cheat treat! In a large bowl, mix the granulated sugar and brown sugar with the butter and egg using a rubber spatula till smooth and creamy. You can also use a mixer on medium speed to do the same thing. Add the maple syrup and vanilla to this wet mixture as well. Then add the flour, baking soda, salt and instant coffee granules. Stir all together. Then mix in the chocolate chips and hazelnuts till even throughout the batter. 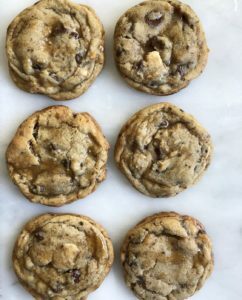 Using a 1 1/2 tbsp cookie scooper, scoop the batter and place on a lined baking sheet with parchment paper or a silicon mat. Different size scooper will yield different size cookies. This size I found to be perfect! Make sure the cookies are 2-3 inches a part so they don’t touch when they spread out during baking. Place the pan with the scooped batter into the fridge for 5-7 minutes to cool slightly before baking. This helps the cookies retain their shape and not flatten out when baking. Bake for 13 minutes. 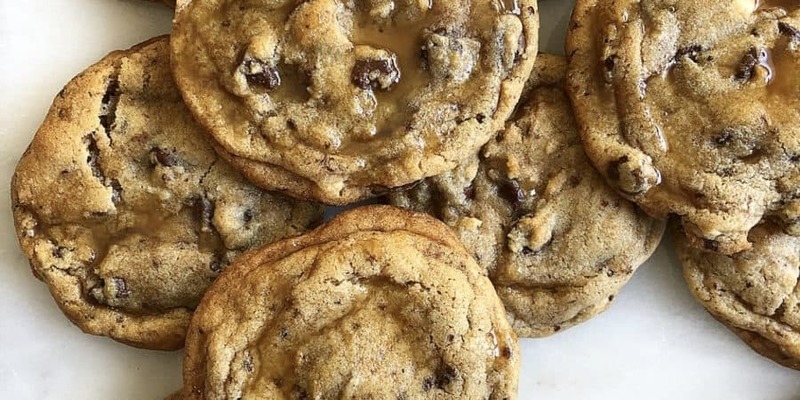 Take out of the oven and let them cool. In the meantime, prepare the glaze. Mix the coffee with the powdered sugar very well. 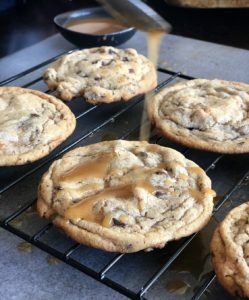 Once cookie is slightly cooled, drizzle the coffee glaze on top of the cookies. Next Post My Weight loss Journey: Part I.